Welcome to the Stamp Jam Blog Bounce! 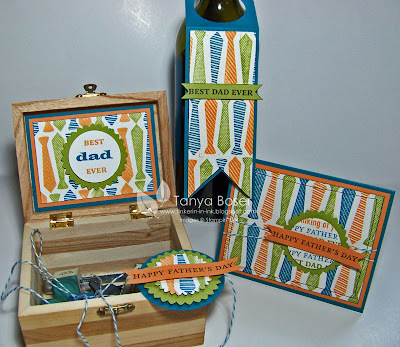 Every time there are 5 Saturdays in a month, Stampin' Addicts hosts a Stamp Jam. And just what is a Stamp Jam you ask? 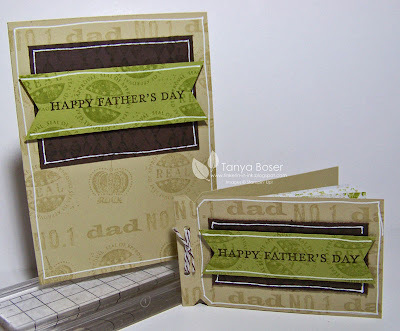 Well, it is a Saturday full of challenges for your Stampin' Inspiration :) You can find the Master Challenge Thread here, where challenges will be posted hourly from 9am EST til 5pm EST. Ok, now my Dad has only worn a tie when he went to a wedding or a funeral, and then it was about a 20 year old tie at that. But this tie set really caught my eye! I think my Dad would even like this bunch of gifts. The box is one we have had around our house for ages and I believe I got it at a local craft store quite inexpensively. It holds the chalk cubes and repair stuff for our pool cues. Yes, we have a pool table. It even gets used as a pool table sometimes! It has held a lot of Stamp Club events too :) I can think of a lot of things to put in a little box, and I know you can still find them for a buck or two. The medallion embellishment on the corner is the sit on top of the box and tie it shut. This tag will hang nicely on a bottle of wine or a bottle of beer, or even a Grape Nehi. Mmm, sounds good right about now, doesn't it. This tag is made with a 2-3/8"x8-1/2" piece of cardstock. Slip one end into the 2-1/2" circle punch and punch to round the top. Lay a 1-3/4" punched circle on the top end and center it where you want your hole, trace lightly with a pencil, then punch out with 1-3/4" circle punch. Score at about 2-1/2" from top edge. Then measure about 1" up from bottom edge and put a pencil mark in the center. Cut up from each corner to the pencil mark to create your dovetail. Take a piece of cardstock 2-1/2"x8-1/2" and scored it at 4-1/4", then fold it in half. Pencil a line 3/8" from the fold. 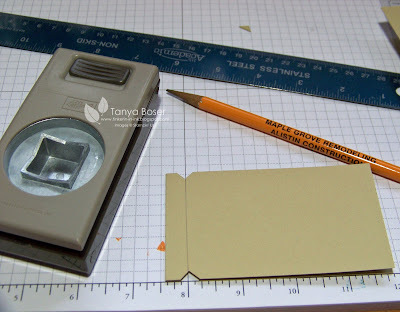 se the 1" square punch to make little notches one each side, using the pencil mark to center the triangles. Erase the pencil mark, open the cardstock back up, and score 3/8" on each side of the fold and crease well. Cut a piece of copy paper into ten 2"x4" pieces. Use the perforating tool on the Cutter Kit to perforate a line 1/2" from the left short edge on all the pages (you can do 3-4 at a time). Slide pages into book cover and punch 2 holes in the end with the Crop-A-Dile, and thread Baker's Twine through several times before tying off. Embellish as desired, and write you coupons out. Now for the rest of the Blog Bouncers!! Wow Tanya you have been busy! Great projects! Love the directions for the coupon booklet. Great projects! Thanks for the notes on the tag and coupon book and for showing how you measured for the fold. The 8" line is so much easier to see that what I have tried - doh! Girl these are AWESOME!!! I love all the ideas and thanks so much for sharing the directions too!! Thanks for helping me out!! Love these!! Those ties look amazing! And the second set is fabulous too! You are so inspiring, as always! 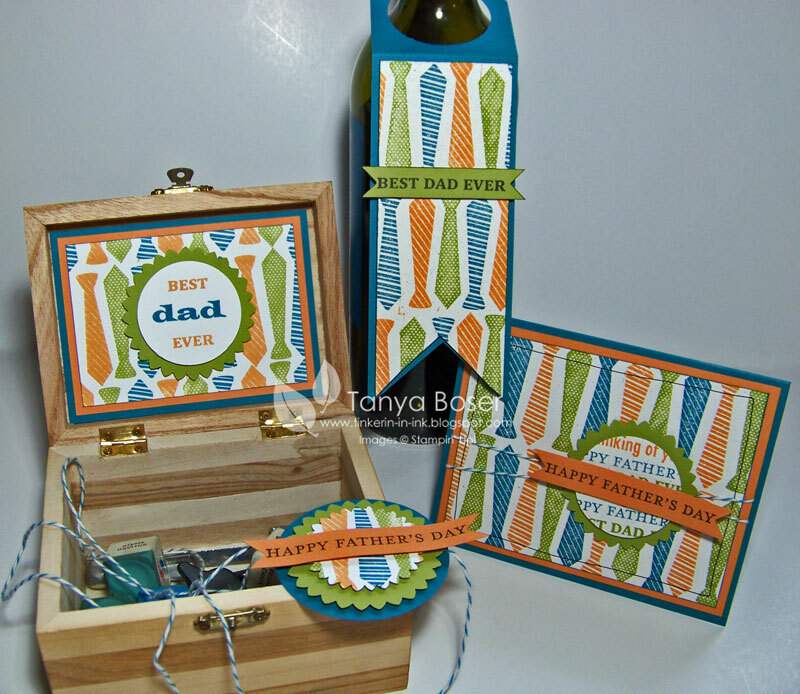 Great projects Tanya! Embellishing wine bottles is always fun. 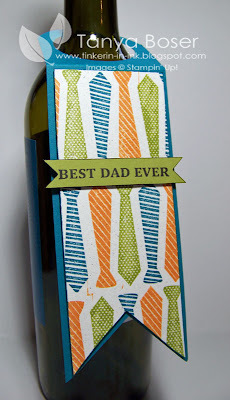 My husband has put in a special request for Father's Day and wants me to decorate a Growler! He even reminded me this morning - can't forget! I love how you lined up all those ties on the card!! The beer tag is wonderful. Does one fit on Johnny Walker Red? I love the coupon book, too. Very cool.